I’m sure there isn’t a single Mizuki Nana fan right now who isn’t patiently waiting for an update on her blog. Kondou Nobumitsu-san, father of Mizuki Nana, passed away on the night of October 29th at 8:40 due to multiple organ failure. Age 75. Born in Ehime-ken. Funeral is to be held among family and close friends. Host of the funeral will be his wife, Michiko-san. Given Nana-san’s relationship with her father, I can’t begin to imagine what her and her family must be going through right now. Being very close with my own dad, I got a teary-eyed just thinking about the situation. I can still remember Nana-san fondly speaking of her dad taking her on a fishing trip when she was young (for more information, watch Yahoo!Live Talk with Mizuki Nana). I hope Nana-san won’t force herself too much the next couple of days. If this message can get to you somehow; take as much time as you need to recover. Your fans will support you no matter what. We will wait for as long as needed. Choose 5 seiyuu before answering the questions that follow. Do NOT look at the questions beforehand, if only because that spoils the surprise of things. There may be questions that, depending on which seiyuu you chose, you will not be able to answer — if that is the case, please elaborate why. LIVE FIGHTER RED SIDE & BLUE SIDE DVD (& BLU-RAY) TO RELEASE ON DECEMBER 25, 2008!!! I don’t mean to spam, but this deserves its own post. Interviewer: –At the end of the first episode (of A’s), the scene where Fate came to rescue Nanoha was very touching. Yukari: At that time, “My husband–! !” was what I thought (laughs). Nana: A husband who came running to save his/her wife who was in trouble. That’s what it felt like (laughs). 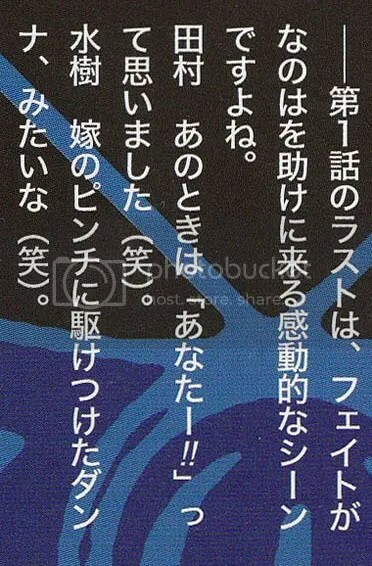 Note: The above interview was taken for the latest (November) issue of NewType (which had some information regarding Nanoha the MOVIE 1st). Anyway, today is a Wednesday, so it’s Nana-san’s turn to host GOLD RUSH. She revealed some very interesting things this week, such as her nicknames when she was young.